Even in a year where I visited one of the best restaurants in the UK, L’Enclume and the best restaurant in the world Noma my first time at Southern Eleven last July was one of my highlights on 2011. I’ve been desperate to go back ever since and yesterday I finally made it. 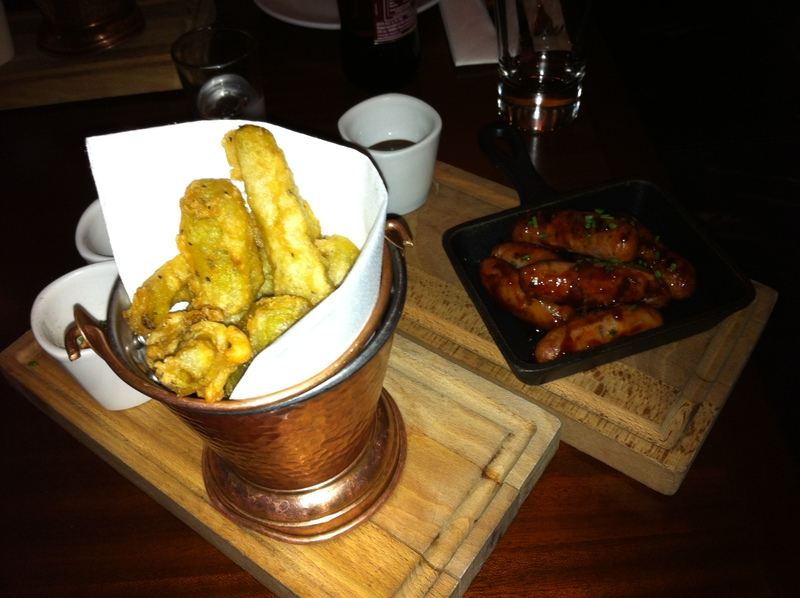 If you don’t know about Southern Eleven it’s an American south style BBQ restaurant at Spinningfields in Manchester. Check out my original review here. The weather was very different than in July and Southern Eleven somehow seems even more inviting on a cold & dark February evening. Perhaps it’s the warmth from the flame lanterns outside. There is certainly a lot of warmth inside Southern Eleven too, from the decor, the staff and particularly the menu. Amazingly despite falling into a BBQ induced food coma on my last visit there were still a few items on the menu I hadn’t tried which I intended to on this occasion. Starting with the deep fried jalapeños which I had literally been dreaming about, to say I was disappointed to be told they didn’t have any would be a massive understatement, try totally gutted. They did have plenty of the deep fried pickle spears which I loved so much last time and thankfully they tasted every bit as good as I remembered. I also ordered the ‘lil sausage links’, incredibly tasty, spicy, mini hotdog sausages with a gorgeous BBQ sauce. Definitely a new favourite. For main course I decided to try a steak and went for the rib-eye. It arrived smelling fantastic and looking great with loverly chargrilled marks. It was cooked well, possibly very slightly over the medium-rare I ordered but I wasn’t complaining. I enjoyed eating it but I just couldn’t help regretting ordering it, not because there was anything wrong with it, it was a good steak. But it was just a steak, there are plenty of places in Manchester to get great steak but there aren’t many you can get authentic BBQ food and I consider not ordering it a mistake. Luckily my partner ordered the ‘Southern Hospitality Platter’ and isn’t a huge meat fan so there was plenty of pulled pork, brisket and belly ribs left for me to share. I think had I gone home without having had any pulled pork i’d have hated myself, just like the pickle spears it tasted every bit as good as I remembered as were the Parmesan Truffle Fries and the coleslaw. Next time I will be ordering the Beef Short Rib for sure. Remembering the pain I was in after my last trip I thought it sensible to skip dessert, particularly as I was on route to a music gig at the Manchester Arena (Noel Gallagher if you’re interested), it was a difficult decision but the right one. I did sample the cocktail menu though, although for me this is the one area that Southern Eleven is lacking. There is a fairly extensive cocktail menu but much of it is their ‘Shake Your Own Cocktail’ section which I have no inclination to do on a night out. I can imagine that it is probably very popular for them, particularly for larger groups of people on Friday & Saturday nights but as somebody that makes a lot of cocktails at home I really don’t want to pay restaurant prices for the privilege of doing it while i’m out as well. Also ruling out a good amount of the cocktail menu is the fact that many of them contain some form of whisky, particularly bourbon, Jack Daniels etc.. not that I blame them, it makes perfect sense given their theme but I’m not a big whisky lover and not at all in cocktails. I did manage a few though and they were excellent, the ‘Hill-Billy’ (A twisted Raspberry Daiquiri) and ‘Sidewalk’ (Brandy, apples, smoked syrup and apple foam) were particularly good. In fact the apple foam on the Sidewalk was very good. Overall another fantastic visit to Southern 11. The staff were again exceptionally friendly and the food was great, living up to my high perception. I’ll definitely be back again and much sooner next time, I won’t make the mistake of ordering ‘just steak’ again as although it’s good it’s definitely the least interesting thing on the menu. I really hope they have the jalapeños too!